This beautiful, high quality name rosary can be handmade with any name up to ten letters long. It would make a lovely gift and personalised keepsake for a girl to treasure for many years. 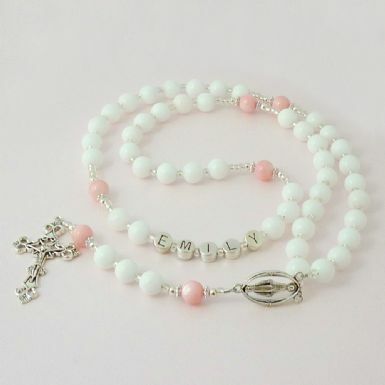 Made with 8mm white jade gemstones for the hail Mary beads and pink Mother of pearl stones for the Our Father beads. Rosaries make a lovely personalised gift for so many Catholic occasions including: First Holy Communion day, Confirmation, Baptism or Wedding day. Size: Long enough to fit over the head on adult or child. Each gemstone measures 8mm. The rosary measures 44cms from the tip of the cross to the top of the beads. From the top of the centre piece to the top of the beads is 30cms. Therefore the total length of the five decades (i.e. the main beaded section of the rosary) is 60cms measured all the way around. Made with: 8mm white jade gemstones, pink Mother of pearl beads, tiny silver lined glass seed beads, Tibetan silver cross and Mary centre piece with silver plated parts. See more Personalised Rosaries with Names for girls and boys made with many different gemstones in a variety of colours. Create a magical moment on the special day of any Catholic girl with these beautiful and unique rosary beads.